The short answer to “when should you change your furnace filter” is once a month during the heating and cooling seasons for one inch filters. The furnace manufacturers recommend a month an inch, so a thick one maybe 3 or 4 times a year. If you are looking to purchase a home, make sure that your real estate agent requests all of the current homeowners heating and cooling bills. This will provide some insight on how well the HVAC system has been maintained. The pleated paper ones are a whole lot better than the very cheap ones that you can see through, although there is no good reason (that I can see) for getting the very expensive ones. If you have allergies, I recommend an air cleaner. But that’s an aside. This post is about dirty filters. Another aside; when, as a home inspector, I see a brand-new filter, I look in the trash can to see if there’s a VERY dirty filter, and take a picture of that. So, It’s easy to see how dirt in the filter slows down the air, making the blower motor work harder. The cost is clear; the motor itself will use more electricity, and will need to be replaced earlier because of the increased load. Summer is worse, because in modern furnaces, the fan runs faster while the AC is running. The faster air flow has a cooling effect that would not be appreciated during the heating season. What may not be clear is the damage done to the heat exchanger. It’s not hard to see; the air passing across the fins on the outside of the heat exchanger picks up the heat, bringing it to the rest of the house, so it stands to reason that it therefore cools the exchanger. Slower air doesn’t bring as much cool air across the fins. They lose their heat slower, so the exchanger gets hotter than it was designed to get. The metal gets stressed, and small cracks form. Those cracks COULD let exhaust gasses like CO to mix with the household air, raising the level of CO in the home. No good. Common? Nah. Deadly? Oh boy. And don’t imagine that leaving the filter out is a solution. A little piece of dust could (will) stick to the outside of the heat exchanger and get VERY hot, acting like a little welder. That tiny spot expands, causing cracks. So, not an option. 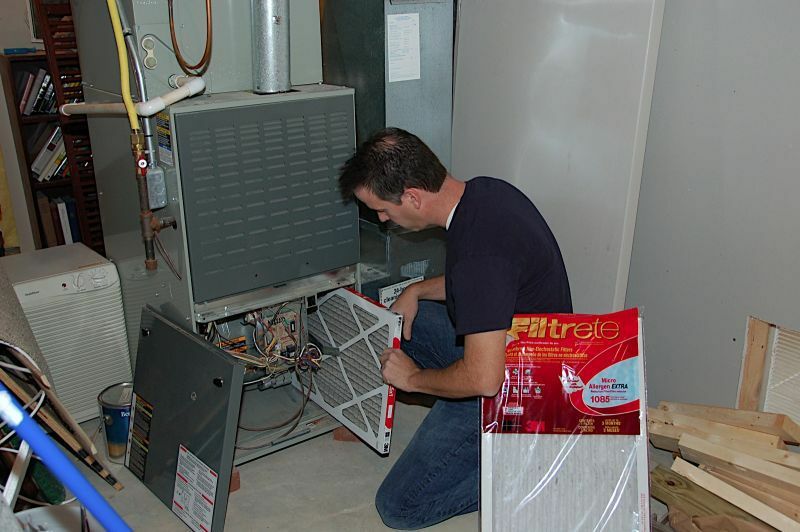 After about 5 years, a furnace is old enough that a major repair bill would mean that replacement is a better option. The two biggest repair items are the blower motor and the heat exchanger. That’s where the biggest cost lies in furnace filter neglect. So do what your dad did, with a modern twist; set up a regular delivery of a replacement filter using something like Amazon Prime, and when the new one comes, change it then.